Toaster - Stainless-Steel - 2-Slice Only $11.99! You are here: Home / Great Deals / Toaster – Stainless-Steel – 2-Slice Only $11.99! Toaster – Stainless-Steel – 2-Slice Only $11.99! 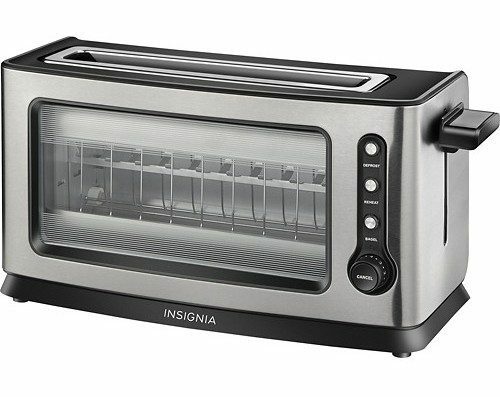 While you are checking out deals at BestBuy, look at this great deal on the Insignia Toaster – Stainless-Steel – 2-Slice for Only $11.99 (marked down $28)! Pick up in store for FREE or get FREE shipping on orders of $35+! 7 toasting settings Make it easy to toast bread to your liking. Cancel, bagel, reheat and defrost options Allow versatile use. Auto-centering bread guide Simplifies operation. The blue-backlit LED provides visibility, even in low-light conditions. See-through glass window Enables you to easily monitor bread as it browns. Removable crumb tray Allows simple cleanup.